In Capçanes we will be very happy to see you, there are different and fun ways to visit us and to get to know the history of our cellar. Every day you can come and taste 3 different wines and learn about the history of the region. You will be welcome in our wine shop at the cellar! ‘4 Garnachas, 4 Soils’ tasting: you will taste 4 wines of Garnacha that has grown in the 4 different types of soil of Montsant (sand, clay, limestone and slate) and you could appreciate how the wines change depending on the soil of origin. Kosher tasting: you will taste 2 of our kosher wines, a young rosé and a crianza, the Peraj Ha’abib, the wine that marked our history. Premium tasting: it is the recommended wine tasting for the gourmets, as you could try our best 3 wines coming from old or singular vines. • Monday to Friday: from 09:30 to 13.30 and from 15:00 to 18:00. • Saturdays: From 10:00 AM to 14:00. • Sundays: From 11:00 AM to 14:00. Summer schedule: Monday-Friday from 9:00 to 13:30. • Saturday from 10:00 to 14:00/ Sunday from 11:00 to 14:00. Public holidays: 11:00 to 14:00. Come and enjoy a leisurely tour around the winery and get to know our special history. Learn about of the kosher winemaking process. We won´t let you go thirsty. 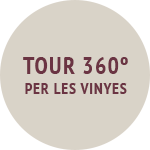 The tour will culminate in a tasting of wines bringing you the flavors of the village. ‘4 Garnachas, 4 Soils’ tasting: you will taste 4 wines of Garnacha that has grown in the 4 different types of soil of Montsant (sand, clay, limestone and slate) so you could appreciate how the wines change depending on the soil of origin. Time schedule: Monday to Friday 11:00 and 15:00. Our sommelier will offer you an induction course about the process of winemaking. She will also describe the characteristics of the Monsant grape varieties and she will teach you how to taste wines. Would you like to work as oenologs and marketing agents? In this workshop you will do our job. In groups, you will create your own wine by mixing the monovarietal wines we will provide you, then you will design the label and sell the wine to the rest of groups. Treballes en el món del vi i vols visitar-nos? Posa’t en contacte amb nosaltres.